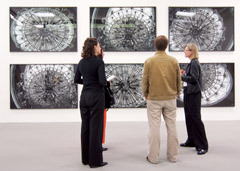 On Friday, August 25, 2005, Galerie m Bochum opend its new exhibition of works by Thomas Florschuetz. Galerie m has been following the rich and varied repertoire of this photographer, born in 1957 in Zwickau, for several years now, and has often exhibited his works. Following fragmentary images of his own body in the 1980s and 90s, the "Plexus" X-ray pictures of the mid-90s, and then the flower, cloud, curtain and window pieces, Galerie m is now displaying the artist’s latest works, which analyze elements of architecture. The Bauhaus in Dessau, the Chapel of Notre-Dame-du-Haut by Le Corbusier in Ronchamp and one of the classic buildings in the London district of Belgravia – these are the places he has captured with his camera. And Florschuetz does this in a way that takes his photography far beyond the mere documentary reproduction of what he has seen. He chronicles the respective situation or building by carefully framing excerpts and exemplary details, extracting ciphers from the architecture with his images which he then uses as the starting material for his works. Florschuetz compiles this image material into one, two, or three-part compositions. In the context of the exhibition site, in this case the gallery, these form a work that can be experienced on many different levels. 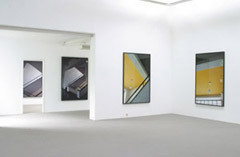 The photographs of the Bauhaus staircase in Dessau, the facades, walls and columns of the chapel in Ronchamp, and the baroque chandelier in the residence of the German ambassador in London all straddle the narrow divide between functioning as a record of the place they were taken and going beyond this in their identity as abstract picture. Oscillating between the recognizable and the inscrutable, the images irritate us by breaking with our notions about these familiar places. Another essential aspect of the works is the principle of a serial or tableau-like arrangement of motifs taken from only slightly divergent viewing angles. Images are thus not only pulled out of their existing context and compiled into a novel composition; they also enter into a completely new kind of dialogue with the spectator.